Curious What the Best Steps to Help Prepare Your Car For Disaster Are? 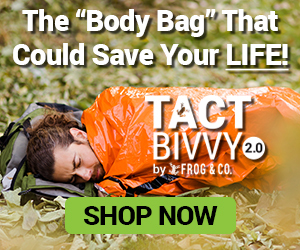 The simple truth is your car’s so much more than a tool to help get you from one place to another…that’s because in a survival situation it can be your lifeline for survival. That’s why when you’re getting your prepper supplies ready you don’t want to overlook what you can do to Help Prepare Your Car For Disaster. Most people incorrectly believe in a SHTF scenario a car will be of no real benefit. And while it’s unlikely you’ll run into a Mad Max situation in the future the truth is your car will likely be one of the most useful survival tools you own (unless of course you haven’t EMP proofed it that is). Take a look at this infographic outlining simple steps you can take that’ll help you get your car prepped for survival. Thanks to our friends from Survivopedia for this awesome image. Now let’s be honest, not all of you are going to be able to follow all these steps. After all, not many of you can just sell your car and get a 4wd vehicle. And for others of you the prospect of sinking tons of money into your vehicle to make it disaster ready isn’t an option. If you’re looking for some other ways you can help make your car survival ready then I can make that process pretty simple. You already know how useful survival kits are, but did you know there are a few that are built specifically with cars in mind? 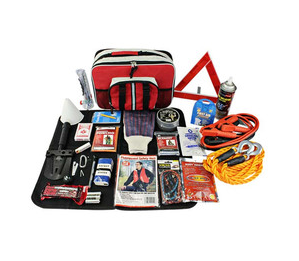 These kits come with tools you’ll need for a roadside emergency along with supplies you can use in case you’re ever stranded with your car in the middle of nowhere. You can click here or on the image below to see a full lineup of our car survival kits. Your car won’t work if the battery’s dead, it’s a simple fact. 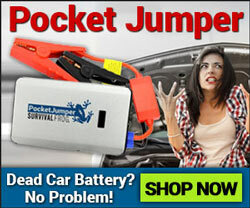 And if you plan on making your car survival ready it means you have to be prepared for the occasional dead battery. And while I’m obviously going to recommend jumper cables the truth is you can’t rely on other people to help jump start a dead battery. Especially in a survival situation. That’s why you need a stand along source of power that’ll jump start your car battery any time any place. One of the best options for this is the POD-X1. This tiny (palm-sized) battery backup holds enough power to jump start a 12 volt car battery up to 20 times. 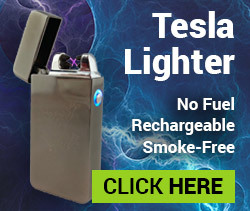 It can also charge portable electronics like cell phones and USB powered radios with ease. Charge it once and it’ll hold a charge for 6 months. Learn more about the POD-X1 by following this link. Odds are if you’re in a survival situation and you’re using your car you might encounter a flat tire or two. So the first thing I recommend is getting educated on how to change a tire. Changing a tire isn’t all that hard and most cars come with all the equipment you’ll need to change the tire. 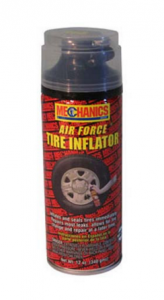 However, if changing a tire is too difficult or just not practical you can always use things like “Fix-A-Flat.” This compound is sprayed directly in the tire and will help you travel on a deflated tire. You can get a can with our auto kit right here. One of the most important things you can do is learn how to fix a car if it breaks down on you. I’m not saying you have to be a mechanic, but it helps to know how to change your oil, change a belt, or fix a radiator hose etc. This can be done quite easily with video tutorials on YouTube or through buying automotive guides specific to your car. With those tools you can fix your car if it breaks down on you; in the process helping increase your chances of survival. This entry was posted in Uncategorized on January 4, 2016 by Survival Frog.